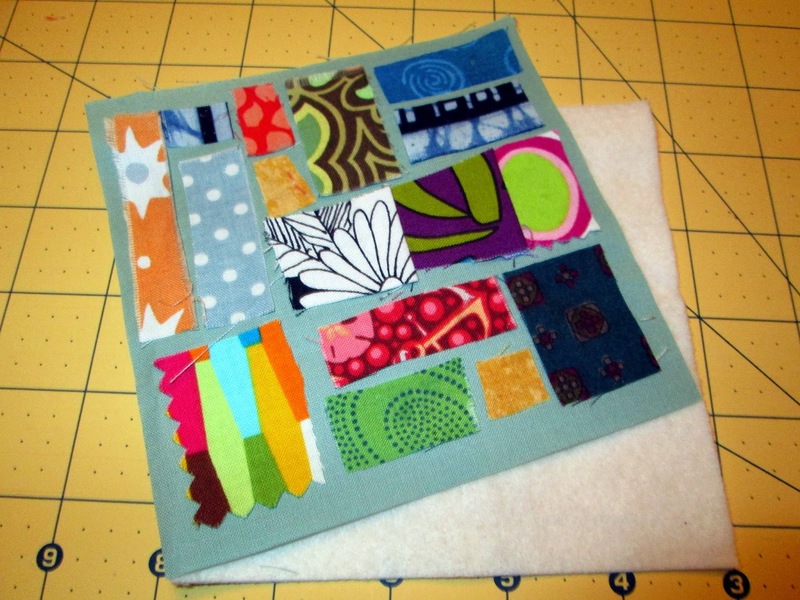 I get the sewing bug in short bursts. I'm not fond of measuring and following specific patterns, so for this snow day creative diversion, I am working with very small scraps of fabrics (tons available at the Scrap Exchange) and 5" base blocks (also scrap fabric). I am using a mosaic style, piecing the small scraps with some of the base fabric showing. A small dab of fabric glue helps them stay in place. I'm leaving the edges raw, rather than try to turn them under like traditional applique. I've seen some great scrappy quilts done this way called "ticker tape", the raw edges get more frayed with washings and use for an instantly well loved and "broken in" look. 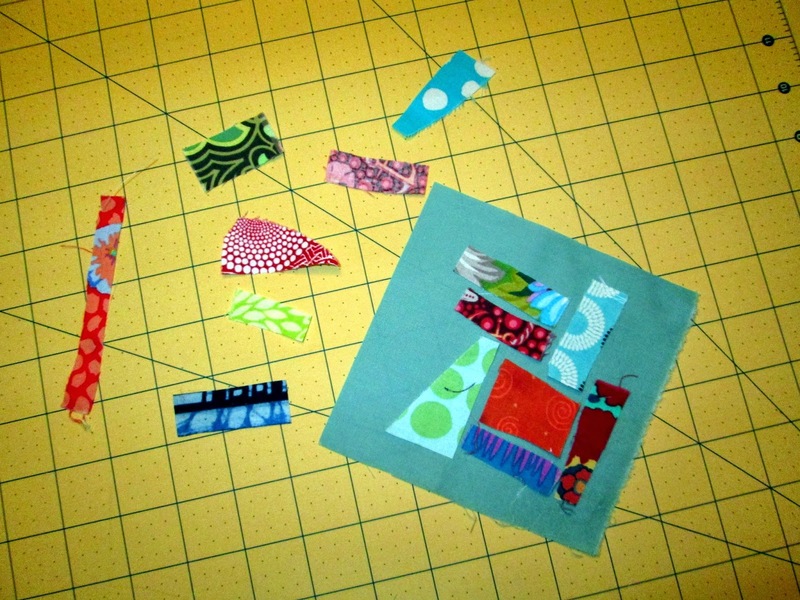 This method of quilting is called "quilt as you go", I am adding the 5" batting to each small block and then quilting the block with stitching that randomly captures each colorful scrap. 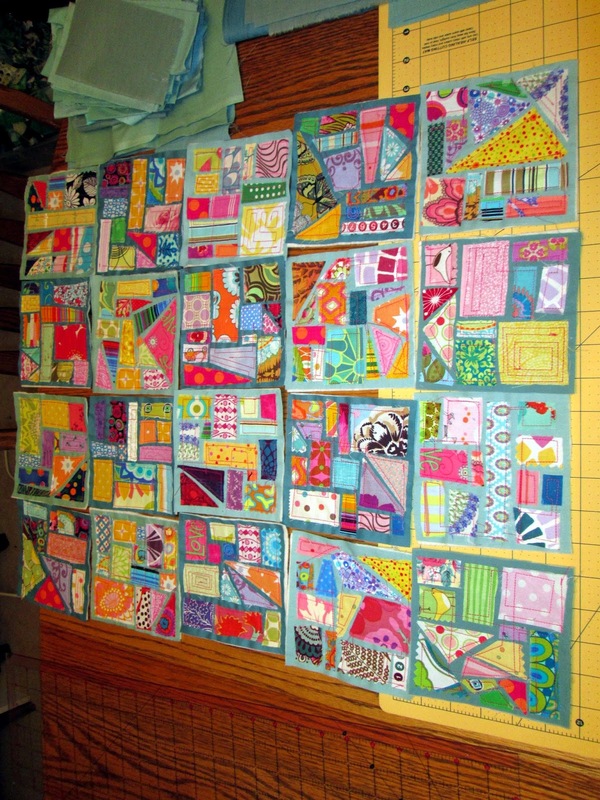 I have looked at several instructions online regarding binding these blocks together, and I think I will try sashing them, or creating small strips between each block to create strips, then attach a backing fabric (also scrap, of course). I haven't started that part yet, but have been quite productive with making the blocks. Yesterday I treated myself to a Valentine's Day workshop led by my friend and fantastic mixed media artist, Charron Andrews. 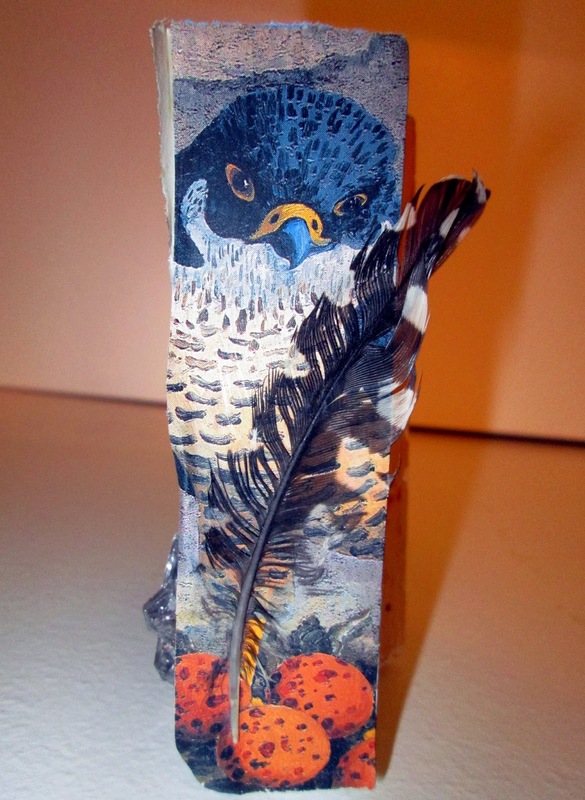 Her work is amazing, pushing the limits of collage, construction, recycling, and most common media (painting, stamping, embellishing,... etc). I have several of her pieces and have been curious about her process. This workshop was about creating small table top or "window sill" shrines, and the various techniques that she likes to use in her process. We began with a sample "postcard", base taken from a repurposed mandarin orange mini-crate. We painted, and applied papers (ripped out of free books from the Orange Cty recycle center), and then filled in the gaps with more paint or applied paper. I did mine in a mosaic like style (of course). We then chose a corner of the mandarin box as our shrine base and started over using the practice techniques as our guide, but selecting new repurposed materials. I found an image that looked suspiciously like my youngest son on a bike, so I decided to use that as the main front image with his face cut out and applied to some metal jewelry scrap. The side images are from a needlepoint book and appeared to me as mother and father figures. Some additional embellishments that I brought from my personal stash of goodies were used to enhance the 3d effect: mini tiles, evil eye bead, metal circle clip, as well as bottle caps with the messages of "rock, paper, scissors" and a bird feather applied to the outermost edges. 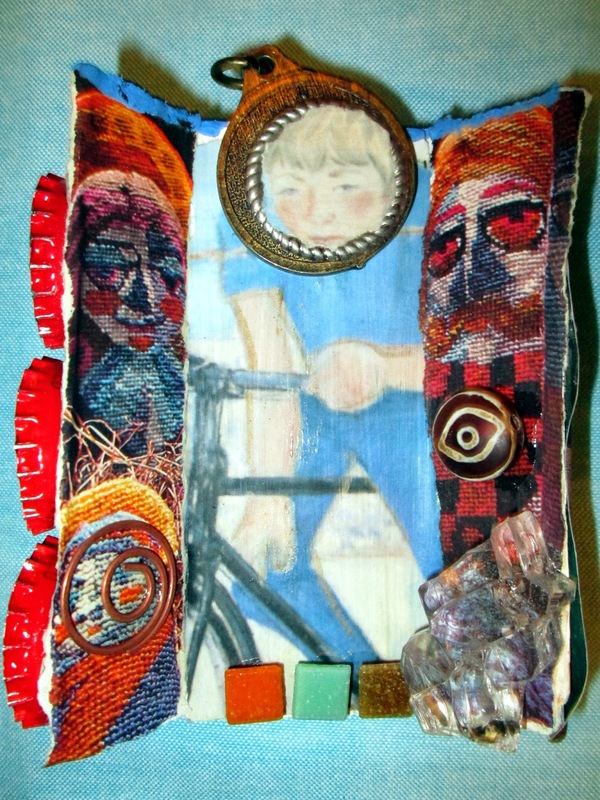 With the potential of a snow day or two looming this week, I may add more embellishment and work on the contrast of the boy/bike contrast to help it stand up against the saturated colors of the needlepoint backgrounds. Those reds/oranges really fade out the light blue. I like the angry bird edge. The Rock Paper Scissors edge needs something else too. Will post again after a bit more work.